The sweet potatoes and stuffing will have to wait when Hayley picks up a distraught phone call from her friend, Analise Smith. On the last stop of a seafood tasting tour run by Analise, one of the customers collapsed—dead. With the police on the verge of shutting down the tour, Hayley can hardly refuse her friend’s pleas to investigate. As the hours to Turkey Day tick away, the pressure cooker is on for Hayley to serve up the culprit. Lucy Burdette is a clinical psychologist who has published 15 mysteries. Her books and stories have been shortlisted for Agatha, Anthony, and Macavity awards. 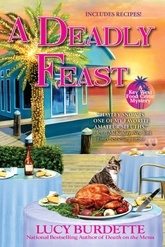 She's a member of Mystery Writers of America and a past president of Sisters in Crime. She lives in Madison, CT, and Key West, FL.